Toddd Glime’s single in the bottom of the ninth gave the Saints a walk off win 6-5 Saturday afternoon at Brent Gould Field. The Saints narrowly avoided extra innings against upset minded Labette. The Saints led 2-1 in the second after an RBI single by Jordan Dallalio and an RBI ground out by Daniel Bruce. The Cardinals plated three unearned runs in the third and led 4-2 until Seward chased home a run in the fifth when Luke Campbell hit a sacrifice fly to make it 4-3. The Saints took the lead again in the sixth when Bruce single home two to make it 5-4. The Cardinals tied the game in the ninth, but Glime’s single gave the Saints the win. Michael Alger pitched the Saints to victory going five innings allowing just one run. He replaced Camron Maldonado who left the game after four innings allowing one earned run. He was lifted due to a blister on his pitching hand. Bruce led the Seward offensive attack three RBI’s. 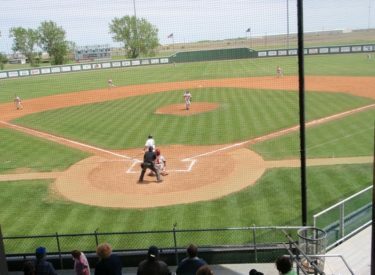 Seward is 29-28 and plays Colby Sunday at 1 p.m. on Talkradio 1270 and kscbnews.net. Labette finishes 23-32.